The HRSPPS is committed to preserving and maintaining historic structures that tell the visitors of today the park’s stories from yesterday. The caretaker’s cottage, support buildings and the suspension bridge at Hillsborough River State Park were constructed between 1934 and 1936. Most of the park’s recreational facilities were constructed between 1935 and 1938. Additional wood frame and native stone residences were constructed by park personnel, and several picnic shelters and a boat house were constructed between 1939 and 1941 from National Park Service plans, probably by the Florida Park Service or its contractors. Come and experience the Real Florida frontier at Fort Foster Historic Site. Fort Foster was one of the original Seminole War forts constructed in Florida during the early 1800s. Today a replica wood picket style fort has been constructed on the original site. 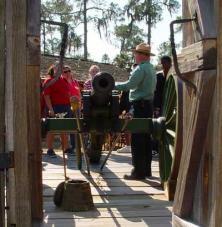 Park Rangers provide tours, and explain the Fort operations and living conditions, as well as telling the history of the Seminole Wars in Florida. A visit to Fort Foster can be a very enjoyable addition to your visit to Hillsborough River State Park. You can climb aboard our park tram and take a trip back in time—two hundred years back in time! The Interpretive Center has exhibits and artifacts describing the Seminole Indian Wars and is open everyday from 8am to 5pm for visitors to browse through.